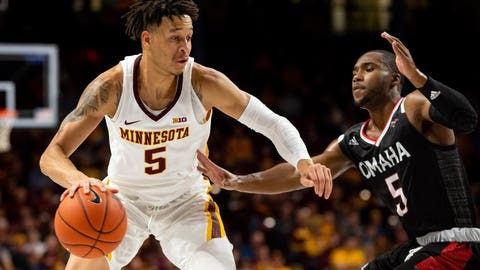 MINNEAPOLIS — Amir Coffey seamlessly took over as the primary point guard. Dupree McBrayer, playing pain free, had his left-handed stroke in midseason form. Daniel Oturu quickly established his 6-foot-10 presence in his college debut. “I’m about as excited as I’ve been in a long time,” coach Richard Pitino said. “When he decides to be aggressive he’s a totally different person, so we need that Amir all the time,” McBrayer said. “When he’s healthy, he’s a really, really good guard,” Pitino said. The Mavericks went more than 6½ minutes into the game without a field goal, including a missed dunk by Matt Pile, until Jackson finally knocked down a jumper in the paint. That gave them a jolt, because they used a 19-6 run capped by a 3-pointer from Gibson to take a 22-20 lead. “Some athleticism caught up to us. Oturu got us on a couple things, some high-major plays that we can’t control,” Mavericks coach Derrin Hansen said. This was Omaha’s ninth game against a Big Ten opponent since moving to Division I in 2011. The Mavericks have won once, at Iowa on Dec. 3, 2016. Minnesota: Washington, the jewel of last year’s class who had a rocky first season, found Omersa with lob passes for a pair of second-half dunks that brought the small crowd of 8,883 to a roar. “Just staying confident, bringing joy to the team, keeping the energy going, trying to keep my guys level-headed,” Washington said.